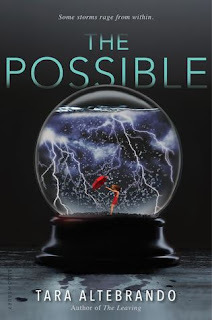 The plot and the cover of The Possible initially caught my eye and I immediately jumped in when my copy arrived in the mail. It was a quick and easy read, but even though I really enjoyed the story the writing seemed a little too simple in the beginning. The characters were a little cliche, and the main character was slightly untrustworthy as a narrator. Initially, it was a little dull for me, but I soon became totally engrossed in the world Altebrando created and finished the novel in one sitting. There's nothing I love more than an easy summer read that you can fly through in a single day, but I would have loved it if Altebrando went a little deeper with her characters. Don't get me wrong, I did like the characters and the story, but I wanted so much more from them! Kaylee was a little rude and and flat while her friends were just typical tag-a-long friends. I kept reading because I enjoyed the plot and I had to know how everything played out in the end. I was a bit surprised by the ending of the novel, and I loved how I was constantly questioning whether or not I believed in Telekinesis throughout the whole book. One minute I thought it all was a hoax and the next I was totally convinced that Kaylee could move objects with her mind. The constant guessing and the twist at the end caught me off guard and made the book come together neatly. I enjoyed reading The Possible and look forward to reading more from Altebrando in the near future. I would definitely recommend this novel for a quick summer read! *Thank you Bloomsbury Publishing for sending me this novel in exchange for an honest review.